In the introductory text I wrote that there aren’t that many bilingual books for adults. I also mentioned that you can still enjoy in bilingual books by using tricks like the one that I’m going to talk about today. 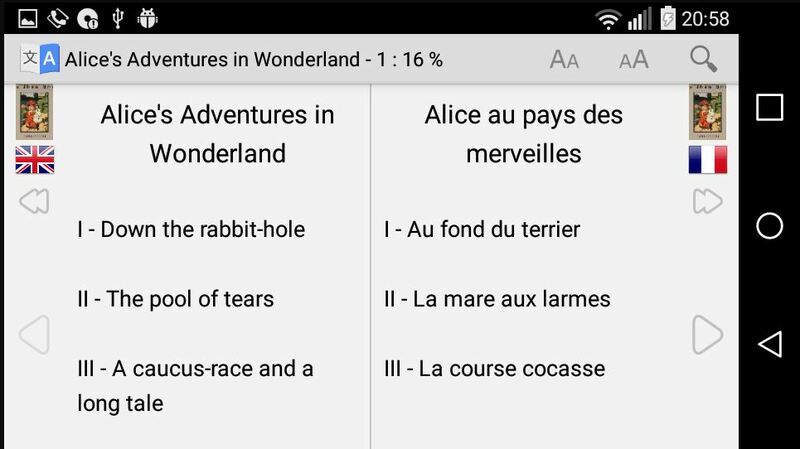 Bilingual Book Reader is an Android app that can be used to load up two books at the same time, side by side. App can be seen in action on the image down below. Loading books into Bilingual Book Reader is pretty straightforward. First you need to load the books that you want to read into the app library. On the image above we have Alice in Wonderland loaded. Two versions of the book need to be loaded, obviously. One is the English version, while the other is whichever language you want to read next to English. In my case it was French. With the both books loaded in the library, select one. I opened English version on the left. Right hand side of the interface was left empty with an option for opening the second book. I opened it and voila, I have my very own, bilingual book. App supports the EPUB document format. You just need to find the translated book of the book that you want to read in bilingual form. Project Gutenberg has a large selection of them. Try it and let me know how it goes.